Psychopathic Writings: Guilt & Remorse. "From what I can gather, as a Psychopath you never feel Guilt at all. Is this true?" Yes, it is true, Psychopaths do not feel Guilt. They do not have the required Neuropsychological basis for feeling this Emotion, and that's how it is also for me. Thus I have never experienced Guilt... that is, I haven't experienced Guilt as an Emotion or Feeling. To me Guilt is not an Emotion but a position that one can be in. Opposite Remorse, to me being Guilty is something you are, not something you feel. You can be more or less aware of being Guilty and accept that you are Guilty to a higher or lesser degree, or you can refuse to accept it. To me acknowledging Guilt is not an issue at all. It is not a problem and I have never felt bad about being Guilty. Being aware that I am Guilty of something doesn't change how I feel. It doesn't make me sad and it doesn't make me think I should be punished. Being Guilty is just that: Being aware that I am Guilty of something. Where being Guilty can make a Difference to me is in what it means in terms of Social Repercussions. This is another fundamental difference between the feeling we call Guilt and the feeling we call Remorse. Remorse is personal, you feel Remorse toward the person you wronged. Feeling Guilty, and being Guilty, is directly related to one's social state and therefore involves elements of personal implications ("What will happen to me? ", "How severely will I/should I be punished?" or "Do I deserve to be accepted by Society?". The feeling we call Remorse cares only about the wronged party, not about society or the question of one's guilt, nor about being punished or about one's own future standing in Society. Because of these differences and because of the non-emotional way that I experience guilt, awareness of being Guilty is for me accompanied by thoughts about whether I can avoid punishment, and if so, how will I achieve that, etc. 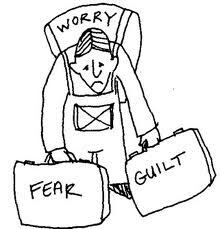 Some argue that Guilt is a Selfish Emotion. Personally I think this is somewhat over simplified, as surely there are positive aspects of worrying about your standing in society (if f.x. you have family). I also refuse to go along with the notion that self interest is always negative. My argument is that if self-interest is negative by definition, then it must imply that everybody are bad, because why is it bad to care about the well being of someone who is a good and talented person who can contribute to society? Surely there is reason in caring about yourself if you think you deserve to get a family in the future, no? Psychopath or not, I have an unwavering belief in my own Goodness and Abilities. But I don't stop there. I am actually quite convinced that I am Great, and whereas I think this is probably a function of my interaction with the Culture I live in, I think the sense of being Good and Capable must be the Natural State of any living being I am quite convinced that the poisonous ideology that preaches Self Denial, Self Doubt and Selflessness is the Result of an Evolutionary Accident which will eventually be corrected as we continue the Journey of Existence. I am not overly worried about the Survival of The Human Species, and I don't feel the slightest bit of Guilt for being so Optimistic as to think the Best in us will find a way to Survive and the Rest can go to Hell! Welcome back :) You've been missed! Anyone who thinks that self interest is bad is completely deluding themselves. There is no such thing as a 'selfless' action, some people just get off to feeling good about things that they've done. I have a question for you, as well. How likely is a psychopath to follow a religion of some description? I'm assuming most psychopaths would find more appeal in using religion as a method of gaining power or control, rather than as something they truly believe in. Am I on the mark here, or not? I would be interested in hearing any comments you might have on the subject. I have a question. I just realized many of the situations that psychopaths often show a lack of empathy in are situations that psychopaths wouldn't be experiencing the same emotions as non-psychopaths. Such as scary situations. So I have a question. When you think of someone who is feeling really frustrated, or some other emotion that you have experienced, do you empathize with them? even though I am not entirely sure whether or not I am qualified to answer your question, i.e. being psychopath, I would say that the case of Maciel Marcial would illustrate your point quite well. However, as Zhawq was saying a post later: Being a psychopath does not mean that you do not care. In fact, precisely, because you think you are great and have a lot to offer, and because you long for a life worth living for, you seek to make a great impact on society. You are certainly not the type of person who lights a lamp and puts it under a basket. You want your light to shine. Doing good for society/other people can cause a great rush of emotions. Being a psychopath neither means you do not want to feel anything, nor does it mean you are devoid of any emotion. So, (in my theory) a psychopath could find the sense of purpose in a particular religion, which satisfies his great need for stimulation, i.e. a deserving challenge, and his strong appetite for life. From my own experience I know that it is possible. Especially, if the particular religion in question appeals to reason. If it was based on mere religious sentiment, I would agree, that it would be more challenging for a psychopath to follow such a religion. My point is: Why should not the (rational!) belief in an entity, who - after death - is going to judge and maybe even punish the psychopath, give him enough reason not only to recognize his guilt - in the present - whenever he fails to oblige to the moral criteria of his religion, but even more so animate him to have the greatest impact possible and become something else entirely? Fascinating blog! Thanks for your transparency-- you've helped me understand someone I know and love who might well be a psychopath. On psychopathy and religion. I get John's position, I think, that we are very good at taking perspectives, so it is entirely possible for us to find a niche in which religion suites us and or made sense. This describes my Father very well , but he was also unaware he fitted the make up of a "psychopath". I think this would be very different to most psychopaths though. My strong personal opinion, and others who I have talked to on the subject, is unvaryingly that religion is a control mechanism used by those in power to control the hearts and mind of the populace. It would be nice to have that power, but that is not going to happen and as such it is a powerful tool which is usually against us. Ordinary people would be much surprised I reckon to know many Psychopaths take the common people perspective and would like to tear religion up for the common good, though of course we have a stake in that pie as well. Guilt - Guilt is what you feel when you do something against the morals of society/your own moral standards and feel bad about it. Guilt does not, however, make me want to 'right the wrong'. i.e. stole a bag of sweets from a shop. Felt guilty. Still ate them though. Remorse - Remorse makes you actively want to change something you did. Please note there's no right and wrong here - I have felt remorse for doing good deeds! i.e. gave a taxi driver a $10 tip (the last of my money), reached for my cigarettes but I've run out. There's a shop opposite but now I've got to go home and get more money to buy the stupid things... I start regretting giving the tip to the driver. I start to feel remorse - I now want to find him and take the tip back. Someone who holds a nail at an angle, knows it isn't going to work but hits it with the hammer anyway and ends up hitting their thumb, regrets their actions and would do anything to undo it - that's remorse. So is regret remorse? If someone says: "Really wish I hadn't done that! How can I undo it?" For me, "Really wish I hadn't done that!" is regret. "How can I undo it?" is remorse. Regret is the suffering bit, remorse feels like you actively want to do something to undo what you did. "I'm sorry for what I said yesterday, please forgive me, I didn't mean it." You regret what you said but it's remorse which is making you apologise for it. You are doing something to try and undo what you regret. Final example, a guy tries a jump with his skateboard but messes it up, falls down and hurts himself. He can regret doing it but hey, there's nothing he can do about it now right? That's pure regret. There is no remorse. As remorse is a strong emotion and you are acting emotionally, it's something guys try and steer clear of - they'll admit they regret something but very few will say it made them feel remorseful. Guys generally don't want to be seen as being driven by they're emotions. As guilt doesn't actually make you want to do anything (you just feel bad about it) it's ok to admit to feeling guilty. You're not being controlled by your emotions. With Guilt you end up feeling bad for doing something. With remorse you want to actively undo what you've done. You can feel guilt without remorse and remorse without guilt. Most of the time my emotions are quiet - like being on a rowing boat in a lake - yeah, every now and then a few ripples hit the boat and it sways a little but most of the time you can feel the emotions (you're on the lake) but don't feel any one in particular. When one rises up (anger, depression, love, hate... blah, blah) it pushes the others aside - like a storm hitting the lake... when you're fighting to keep the boat afloat, who cares about what the water's doing 6 foot down? Or, it's like when your emotions are calm it's night time and you can see all the stars... when one becomes powerful it's like the sun suddenly comes up and you can't see the stars anymore because the sun's so bright.